To see if your land is affected by salt, a few steps need to be taken, such as testing your soil. Special equipment is needed for this, which you may not have at your disposal. We therefore suggest getting in touch with a nearby farmers’ cooperative, who may have access to the necessary equipment. What steps do you need to take to see if the methods of saline agriculture would work on your land? Is your soil affected by salt? How many samples were taken and how many times did you test? Did you test in different season? Have you determined the salinity level with the protocols before? In this video, you will see how to take soil samples. This is the first step in the process to see if your land is affected by salt and if saline agriculture would be your solution. You can download the step by step instruction in the link below for an easy reference. Now you have collected your soil samples, we need to see if they are affected by salt. In this video you can see how salinity is measured, using the so-called ‘1:2 method’. Note: you need an EC meter to be able to follow step 2. You can download our step by step instruction to perform the test through the below link for an easy reference. Step 3: Reference Table: What crops can you grow? If the results of step 1 and 2 show you have a salinity problem, we need to see what crops could grow on your soil. That depends on the exact salinity level. 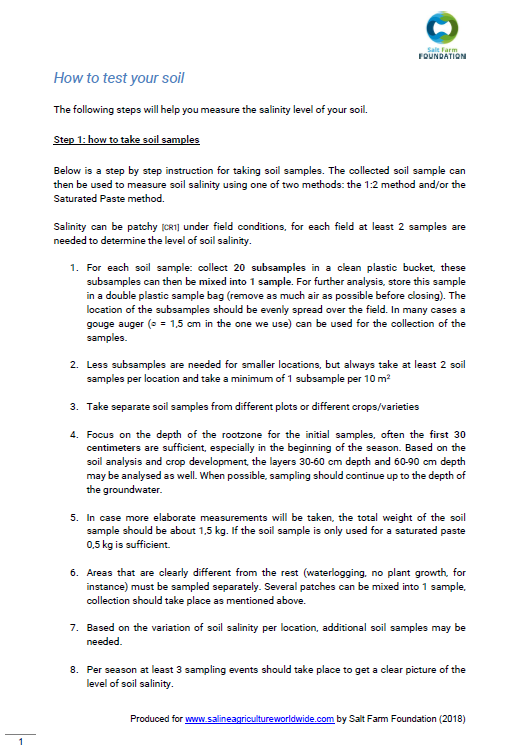 If you have not performed the steps to sample and measure soil for salinity, please click here. The below tables give a general classification of different crops and their suitability for saline agriculture. Keep in mind that of many crops there are very salt tolerant varieties, even under strongly saline conditions yields of for example 75% of the maximum yield is still achievable. 1-3 Moderate Salinity Many common crops such as potatoes, tomatoes, carrots, cabbages, olives, sugar cane, millet. 3 > Strongly Salinity More specialized crops for salinity such as sugar beet, cotton, barley, quinoa or halophytes. 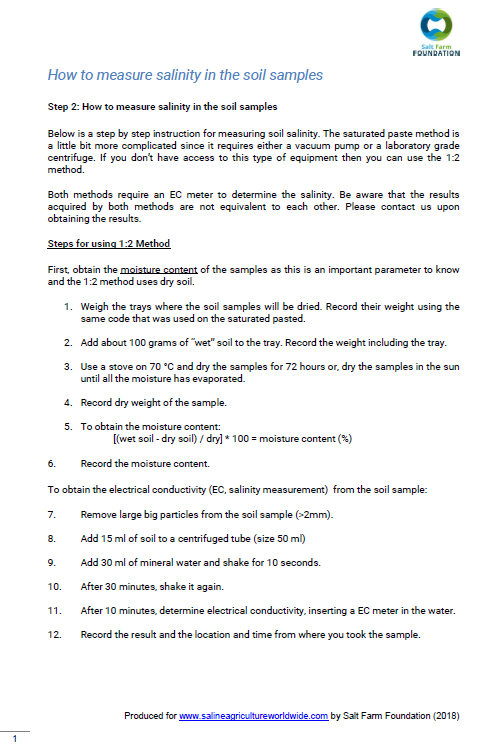 If you have used our alternate method - "Saturated paste method" to test the soil, please click on read more. 16 > Very Strongly Saline Suitable for halophytes such as Salicornia spec., Aster tripolium etc. Thank you for taking the first step towards Saline agriculture. In the following steps, you can fill in your personal details and answer some questions related to your environment so that we could help you better. Are there any results present on soil nutrient concentrations, pH, cation exchange capacity (CEC), sodium absorption ratio, and organic matter content? Thank you for sending us the questionnaire. Our team will look into your submission and contact you to see if saline agriculture works for you, and how we can further assist you. Additionally, you can also reach out to us through our email - info@saltfarmfoundation.com.